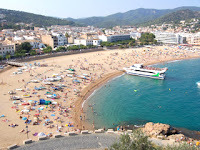 Although my blog centers around Barcelona-based information, we are in August and in the middle of the summer, so I thought it appropriate to shed some light on a wonderful and little-known picturesque coastal town on the Costa Brava. From Barcelona, it is about a 1 to 1.5 hour (103 kilometres) drive north. 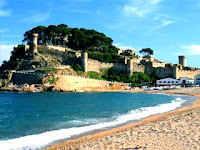 The place I speak of is called Tossa de Mar and it is a nice vacation spot for the Catalans that want to get away from the big city hustle and bustle but dont want to struggle with or complicate their travel plans. Despite its rather small size and population (roughly 6,000 people), Tossa De Mar is bulging with beautiful beaches and sheltered coves, with the two beaches in Tossa De Mar both awarded the Blue Flag for cleanliness. The wonderful crescent-shaped bay is backed by bars, cafes and restaurants serving delicious local mediterranean cuisine and international dishes to suit everyone`s taste. The temperature in Tossa De Mar can range between 13-18° out of season and up to 30° during the summer months. In the evening you have a choice of a number of bars, discos and seafront cafes, but Tossa De Mar is not really renowned for it`s liveliness - so if you want to really party hard all night long then just head to nearby Lloret De Mar in the south. 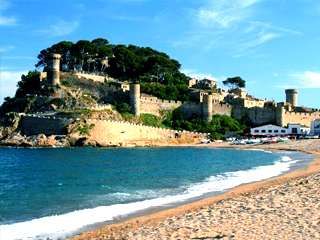 If you want to take time away from the beach scene and explore the cultural side of Tossa de Mar, start by walking around the beautiful Old Quarter, with it`s 14th century castle and wall. Also follow the main path that will take you to the lighthouse at the top of the hill which offers breathtaking views. 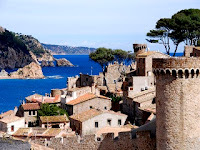 Tossa de Mar is like an open-air museum where prehistoric remains overlap with RomanTurissa, medieval Tursa and today's Tossa, one-time retreat for artists and intellectuals and now host town for tourists and visitors. The best way to get there is to drive, but if you dont have that option then there are buses that travel from Barcelona to Tossa de Mar daily.